Even though Google is excusing the update for few weeks, you can still grab an unofficial Android 4,4 KitKat Update on your new Nexus 7 (2013), all thanks to SlimKat ROM. SlimKat ROM is based on AOSP code of Android 4.4 that Google released to pubic, right after launching the KitKat update. SlimKat is a very trimmed down version, removing the unnecessary stuff, though, you can install that separately. So you bought the latest new shiny Nexus 7 Gen. 2 and disappointed that it didn’t come with the Android version which doesn’t have “Jelly Bean” in it’s name? Well, we don’t blame you. Android 4.3 wasn’t very proud update from Google. So, let’s see how to update your Nexus 7 (2013) to Android 4.4 KitKat Update. To make sure your device is eligible with this, you must first confirm its model no. in ‘About device’ option under Settings. Another way to confirm model no. is by looking for it on the packaging box of your device. It must be LTE-Nexus7 2013; codename: deb. Do not flash this on other variants of the Nexus 7. You must do this pre-installation stuff before attempting to install the ROM on your LTE-Nexus 7 (2013) in order to avoid any complications later, and have a smooth and successful process. Back up important data and stuff before you start playing around here as there are chances you might lose your apps and app-data (app settings, game progress, etc. ), and in rare case, files on the internal memory, too. You must have proper and working driver installed on your windows computer to be able to successfully install a firmware on your Google Nexus 7 (2013). In case you’re not sure, follow the link below for a definitive guide for installing driver for your Nexus 7 (2013) on your computer. If your android device powers off due to lack of battery while the process is underway, it could damage the device. So, make sure your device is adequately charged — at least 50% battery of the device. If you haven’t used a custom recovery, either CWM or TWRP, before, to install a .zip file of a ROM on anything esle, then we suggest you first watch a video of that, given right below, to get familiar with the process. Just fyi, the video below shows installing a .zp file of recovery on Galaxy S3, but it doesn’t matter as the process remains exactly same. So, once you are finished with video, jump to downloads and step-by-step guide below. Make sure you have backed up your tablet adequately (including important data stored on internal memory). Before, you start make sure you have copied the file: Slim-deb-4.4.alpha.1-UNOFFICIAL-20131106-0610.zip to your LTE-Nexus 7 2013. And remember the folder you copied the file in. You will need CWM recovery to be able to install the Android 4.4 on your Nexus 7. For which you will need to unlock bootloader first. So do that using the link below. After unlocking bootloader, install the CWM recovery, using which we can flash the Android 4.4 ROM. Copy the two files you downloaded above to your Nexus 7: Slim-deb-4.4.alpha.1-UNOFFICIAL-20131106-0610.zip and Slim_AIO_gapps.4.4.alpha.1.zip. You are in bootloader mode now. Press Volume Up or Down to bring up Recovery option, and then select it using Power button. └ In recovery, use Volume buttons to navigate Up and Down between options and use Power button to select an option. Scroll down to backup and restore option, using volume keys and select it using Power button. Again select backup from the next menu. It will do the rest. Now, when the backup finishes, go to Advanced >> Reboot Recovery. Select Install zip » Choose zip from sdcard » browse to the location where you saved the file and select the file, Slim-deb-4.4.alpha.1-UNOFFICIAL-20131106-0610.zip » select Yes on next screen to confirm installation of the file. That’s it. KitKat4.4 ROM has been installed. Now, as it lacked Google Apps, you got to install the Gapps file, Slim_AIO_gapps.4.4.alpha.1.zip like you installed the ROM file in previous step. └ Make sure to flash the ROM file first and then the Gapps file. 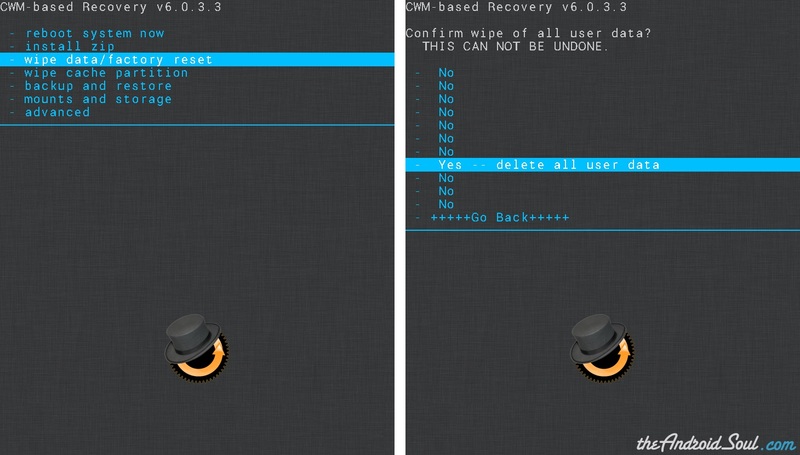 Go back to the main menu of recovery and select reboot system now. That’s all. Your tablet will now reboot and it will take some time as it’ll be tablet’s first boot after installing Android 4.4. Be patient, and excited! It was easy to install KitKat, the latest version of Android, on your LTE-Nexus 7 2013, right? Let us know how it tastes.